One measure of the importance of a music is its worldwide level of recognition. Jazz, as the indigenous American music reached this status quickly. Much of Jazz’s worldwide, and particularly European importance is due to jazz guitarist Jean Baptiste “Django” Reinhardt. 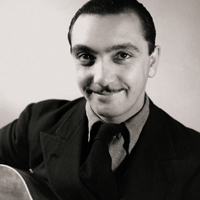 Django Reinhardt is still commonly referred to as the most influential European in Jazz ever. Reinhardt was born on January 23, 1910 in Liverchies, Belgium, and grew up with a camp of Gypsies near Paris. Django first took up the violin, but at the age ten began playing the guitar. As he was playing on a borrowed guitar, a neighbor overheard him playing and gave him an old-fashioned banjo-guitar. From this point on, he was determined to become a musician. He had little interest in formal schooling; he only attended for one day. He began to play the Paris dance halls before he even turned 13 years old. In 1923, he won first prize in a contest conducted by dance hall musicians. In 1928, as Django was preparing for bed, the trailer in which he lived with his pregnant wife, Naguine, caught fire. In the fire, two of the fingers on his left hand were seared together. In the hospital, they managed to separate the two fingers, yet they were still permanently paralyzed. Despite all odds, he was able to play the guitar again, as he invented a new chord technique to allow him to play with only two fingers. Django was a free spirit in the truest sense of the phrase. He dressed like a Gypsy prince, and was not particularly reliable, as he oftentimes missed gigs to dine with his Gypsy “cousins.” Along with his two-fingered playing he was certainly a sight to behold. As the quintet gained fame, attempts were made to clean up Django’s unkempt look. After he gained a bit of notoriety, he began to have more appreciation for fine clothing, but did not lose his flamboyance. He refused to bring an instrument to a show, which was normally okay because one of his cousins would carry it for him, but was a problem when he traveled to other countries. When he arrived in the U.S. he asked “where’s Dizzy?” hoping to meet Gillespie, as he had become a big fan of bebop. There was however not enough time, as Reinhardt had to hurry directly to Cleveland for his first date opening for Ellington. Reinhardt was disappointed to see that his name was not on the flyer promoting the concert. It is unknown whether the promoter had not heard of Django or just did not wish to advertise his appearance for fear that he might not show up. The tour ended with a two-night stand at Carnegie Hall, the second of which Django arrived to late without a guitar. Uneasy playing marred his entire stay in America, as he was never able to find a guitar with which he was comfortable. After the tour he played solo for two weeks in various cafes around New York, but soon tired of America and wished to return home. When he returned to Paris, he proclaimed Frank Sinatra as the best thing he heard in America. By 1952, Reinhardt had begun to settle down with his wife, Naguine, their two sons and his elderly mother in a small house outside Paris in Samois. He continued to travel frequently to concerts. However, on the morning May 16, 1953, upon awakening Django called to his wife in pain saying he could not move. His wife called a doctor, but before the doctor arrived, Django felt better and got up and left the house to visit friends. As soon as he left the house, he collapsed. He was rushed to the hospital but never regained consciousness and died of a cerebral hemorrhage. Reinhardt is still remembered today as one of the all-time great guitarists in jazz music.